Great meeting, full of positive energy and a lot of progress made on a long journey. 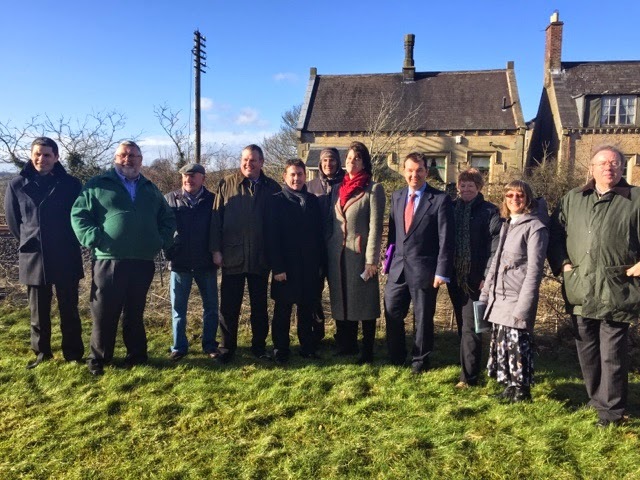 This was the first chance to get Network Rail, Northern Rail, the key councillors from Northumberland County Council, the Tyne Valley Rail Users Group, and the leaders of the COGS [Campaign to Open Gilsland Station], and the BBC all together both outside the proposed station, and then inside the warm of the Samson Inn. My thanks to everyone who came, and the BBC team who stayed to film for Look North in the cold. A lot of the people present had come a long way whether from York or Morpeth to come and listen, learn and see how they could help. For some people it was their first chance to see why this unique project will have so much of a tourist and economic impact, as well a huge impact on transport infrastructure locally. I have to thank the locals wo are driving this project forward. They are too numerous to name but the tireless and ever smiling Alison and Julie should be praised in particular. These meetings are no a magic wand. But they are priceless for their ability to bring everyone together behind a shared vision. Really grateful to the team from Network Rail and Northumberland County Council for coming, and their positive approach. And thanks to Claire who travelled up by train from London specially to go to Carlisle, Newcastle and Gilsland. The Chancellor and the local Labour Councils have come together to agree an integrated way forward for joined up healthcare locally in Manchester. "This is what the NHS wants to see as part of its own future. And it's also about giving people in Manchester greater control over their own affairs in that city, which is central to our vision of the 'northern powerhouse'- so it's a very exciting development," he said. The plan would see local leaders, and ultimately Greater Manchester's new directly elected mayor, control how budgets are allocated. The government hopes integrating health and social care services will ease pressure on hospitals and help to improve home care services for patients who need it. A shadow Greater Manchester Health and Wellbeing board will be appointed, which will work closely with existing clinical commissioning groups of GPs. The board is expected to run from April, before control of the budget is handed over a year later. Manchester City Council confirmed 10 local authorities, 12 clinical commissioning groups, 14 NHS partners, NHS England and the government are in discussions on a "ground-breaking agreement for health and social care". The question for us in the North East is whether we can follow Manchester's lead? If we can then much more devolution will follow but they are several years and a lot more integrated than the NE Local Authorities. Mitochondria are the tiny compartments inside nearly every cell of the body that convert food into useable energy. But genetic defects in the mitochondria mean the body has insufficient energy to keep the heart beating or the brain functioning. The structures are passed down only from the mother and have their own DNA, although it does not alter traits including appearance or personality. The technique, developed in Newcastle, uses a modified version of IVF to combine the healthy mitochondria of a donor woman with DNA of the two parents. It results in babies with 0.1% of their DNA from the second woman and is a permanent change that would echo down through the generations. I have accepted a challenge to debate my Green Party opponent in May's General Election, made in the Hexham Courant. This brings to 5 [along with Labour, liberal democrat and Ukip] the contenders in the Hexham constituency election, who will be debating in a series of debates in April. I also should congratulate Lee Ferris on his selection a few weeks ago as the Green Candidate. At present, I am not aware of any other candidates or parties wishing to put in - last time we also had 2 Independents and 1 representative from the BNP. I am a passionate believer in democracy and it seems perfectly fair to me that candidates should debate each other. I have signed up to 5 local hustings, with a farming one pending, and I expect to all the parties named to be invited. I would be more than happy to do a TV debate too and I have accepted their Green Party TV debate. I believe all parties should be represented in TV leaders debates. I don't see why I should be any different. 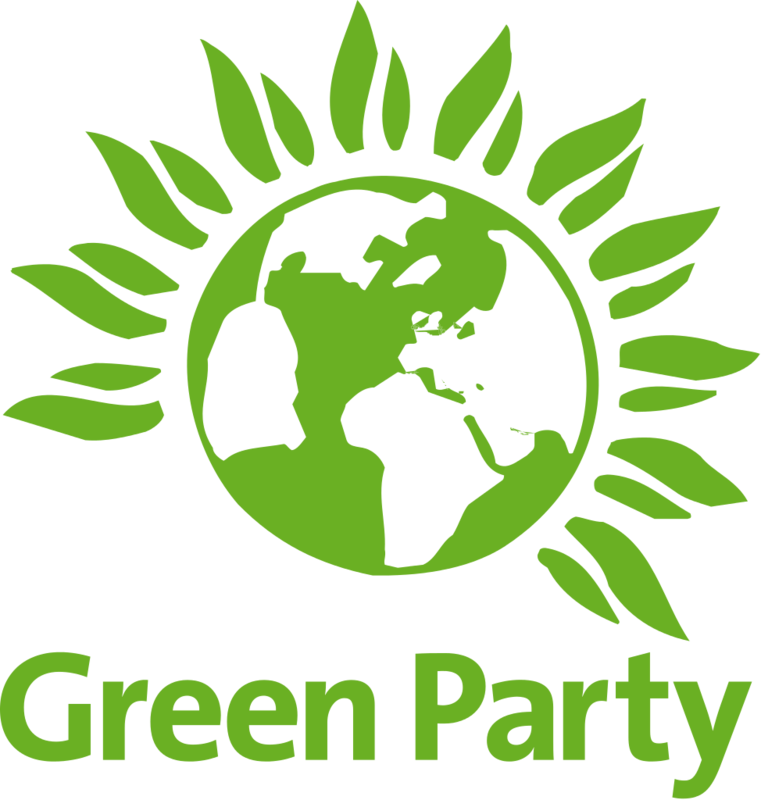 I watched the Sunday Politics in the NE 4 weeks ago and was interested that the BBC described a Green Party surge. I am not sure I'd describe it as surge, but even from my own canvassing in recent weeks and months there is no doubt there has been an increase in Green support. The General Election is now just over 2 months away. I have been asked to post the dates of the hustings - see earlier blog posts. When they are all fixed I will do so, but there is a bit of logistics to sort first, so bear with me, not least as this is beyond my control, as churches and local community groups are doing the organising, and other candidates are having to jiggle their diaries around. In particular, the farming debate is proving very difficult to fix. There will definitely be hustings in all the major towns in April. At present the intention is to have debates in Hexham on the 18/4, Prudhoe on the 20/4 and Ponteland on the 24/4 but the Church groups and Hexham Debates will notify in plenty of time. My plan is to take Claire to meet the team behind Gilsland Station on the Cumbria Border and see why the COGS campaign is worth backing. Precise details of the trip are still being worked upon but I am liaising with key local stakeholders as we sort the details of the trip, when she gets in from Carlisle, and how long we will have Claire with us in Gilsland; not least of our decisions is which train she is going on! Monday sees Home Office meetings, the remaining Stages of the Serious Crime Bill, and various meetings in Westminster. Tuesday I am meeting with William Hague to discuss his plans for English Votes for English Issues, then we have further bills in the commons. Tuesday evening we have a meeting with the Air Ambulances as a result of the announcement of the Libor funding. There is a debate on the BBC, and also on Equitable Life on Thursday in the Commons but I will be in the constituency from Wednesday night very late until the following Monday. 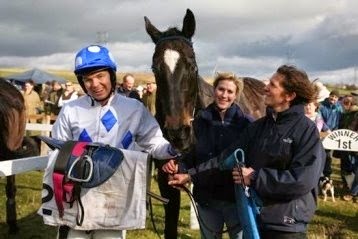 Exactly 6 years ago on 1/3/2009 I rode my last winner at the Tynedale Point to Point. I still remember every bit about the day, the race and Lowlander, the horse, who did the hard work! The report of that race in 2009 is below. 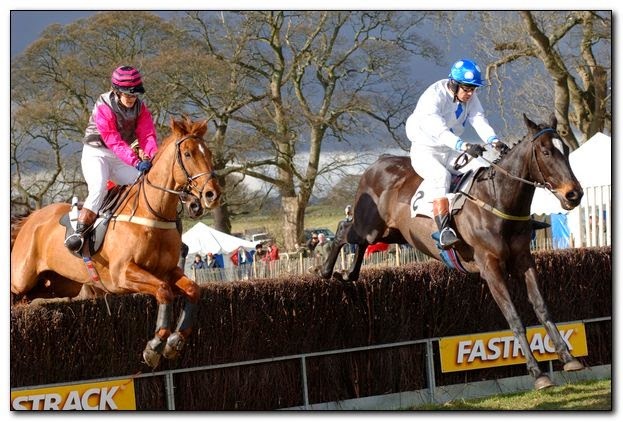 So I will definitely be at the point to point next Sunday. Access is off the Military Road, near Aydon. Please come along - there is lots for all the family to do and the atmosphere is great. And yes I miss racing all the time! The unemployment rate in the North East of England fell by 1.2% on the quarter which is the largest percentage fall of any region/country in the UK matched only by the West Midlands. Trying to bring in wholesale welfare reform and change the benefits system so it rewards a gradual return to work is never going to be easy. Yet I genuinely believe that universal credit, in 10-20 years time, will be seen as one of the bravest and best reforms of the Coalition Government. Its roll out has been slow and steady - to try and make sure it is got right rather than rushed. This, in itself, is different to the norms of all governments, which have a tendency to announce and then be surprised that the devil is in the detail. It started in the north east Monday. This new, consolidated benefit will replace six working-age payments (jobseeker’s allowance, housing benefit, working tax credit, child tax credit, employment and support allowance and income allowance) and should be on offer in all job centres next year. All parties support Ian Duncan Smith's reforms, although Labour constantly snipe that it is too slow, or not road tested enough. Such is their way. But don't take my word for it. I could refer you to right leaning papers estimations but take it from the Guardian. "The universal credit may well reduce the colossal benefits bill. But its primary purpose is to simplify the process for claimants, to base payments upon collated and up-to-date information (the hardest bit), and to reduce the marginal penalties and disincentives in the present system that dissuade claimants from taking on more work. Those who believe that Duncan Smith’s purpose is to shrink the state or slash public spending do not understand him. They may well despise his definition of “social justice” and its emphasis upon personal responsibility. But – in contrast to many Tories – he undoubtedly sees welfare through an ethical rather than a fiscal prism." Some of the companies handling the complex computer programmes behind the roll out are in the North East. I have met some of these local people. We should be proud that it is north east based people helping bring about the change that takes away the benefit cliff edge and encourages a steady return to work, supported as you go. - it is as an important step towards a welfare system that protects the vulnerable, without promoting the economically and socially destructive phenomenon of dependency on the state. That is a project worth striving for. We are in the midst of a debt crisis with the EU / Greece talks stalling. Syriza and it's finance minister know Greece is broke and bankrupt in literally weeks, but they are banking - excuse the pun - on the EU bailing them out on their terms, again. I don't see it happening. And, more importantly, I don't think it should happen. The EU have said there is no alternative to a debt extension for Greece. If Greece says no then it should leave the meeting and prepare to leave euro. If we keep giving in to Greece then what do we say to the Irish, the Spanish, or our own countrymen and women who have had to cope with the difficult decisions and the hard process of balancing books in difficult times? I genuinely now believe that any euro difficulties caused by Greek departure from the euro would be less than an enforced continuation of a farce when Greece will clearly never pay. But the consequences for Greece, and the rest of the EU will be significant and destabilising. Nicola Sturgeon, the SNP leader, has indicated that ignoring any attempt to balance the books, spending loads more that we do not have, changes to defence spending and a whole swathe of new powers for Scotland would be the party’s price for a deal. The popular Haltwhistle Walking Festival returns this Spring. It features walks around Hadrians Wall, the Pennine Way, Isaacs Tea Trail and assorted local walks taking in local history and landmarks. The team behind the festival are very enthusiastic, and the walks are good fun, normally ending in a pub or tea room, so take your choice. The Walking Festival returns on April 25thto May 4th and promises to be a wonderful experience for all involved. There are plenty of walks available for all different ages and fitness levels, but you will definitely want to book ahead as this event is always a local and tourist favourite and fills up quickly. I would love to take part this year but I fear these ten days may be a little busy for me. I do not always agree with local Headteacher, Bernard Trafford, who writes regularly for the Journal. But on the issue of Labour's Shadow Education Secretary Tristram Hunt's fixation - and proposed policy under a Labour government - that no teacher can teach without a specific teacher training qualification I do agree. The policy is that Labour in government would effectively ban all teachers who did not have a teacher training qualification; I, and others across the House of Commons, including Labour MPs, have been pointing out the illogicality and "one size fits all" approach of Hunt's position in the House of Commons for 2 years: not least as Hunt is a historian, who has successfully taught history himself.... despite being unqualified. "His [Hunt] obsession with teachers having to be qualified is boring, as well as dogmatic. By “qualified” he’s talking not about subject knowledge but about completing teacher-training. Take him as an example: he wouldn’t be deemed competent to teach, despite a history degree, unless he’s done teacher-training. The vast majority of teachers are classroom-qualified, as well as in their subject specialism. They should be. If I appoint teachers to my (independent of government) school who don’t have a teaching certificate, I help them get one. It generally makes them better teachers and gives them a go-anywhere qualification. But sometimes, just sometimes, I interview amazing natural-born teachers who outshine even those who have been through the formal training programme. Hunt wants to ensure that no one teaches children without that qualification. I find politicians like him insisting on everything being black and white just as bigoted and out-of-step as those private school heads who aver that teacher-training somehow prevents teachers from being inspired and original: that’s rubbish too. Hunt’s insistence on conformity leaves heads and schools no flexibility (which we need when there’s a teacher-supply crisis), outlaws the unconventional genius and risks imposing a dull orthodoxy on all our schools. But then, I fear that’s what he wants." Queen Elizabeth High School is to be handed millions to upgrade it's schools buildings after our long campaign. The Department for Education has announced the school has been successful in a funding bid as part of the government's Priority Schools Building Programme. It is a huge relief our campaigning and lobbying to ministers has paid off. This is the most significant cash investment in Hexham's schools for decades. It is fantastic that the Government has listened to our case, recognised the buildings at QEHS need upgrading and has now provided that investment. When I first became an MP in 2010, one of the key messages I was hearing from local people was that not enough was being invested in our schools. It has been one of my key priorities ever since. It is a huge step forward that we have been able to secure this capital investment in QEHS buildings on top of the extra £12m we have secured for Northumberland's schools this year. 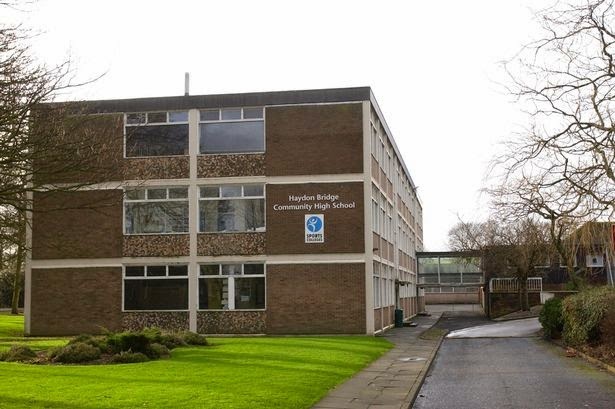 Northumberland County Council also deserves some of the credit for taking the bid forward on behalf of the school, having previous had success with a bid for the total rebuild of Prudhoe High School, which starts in March. 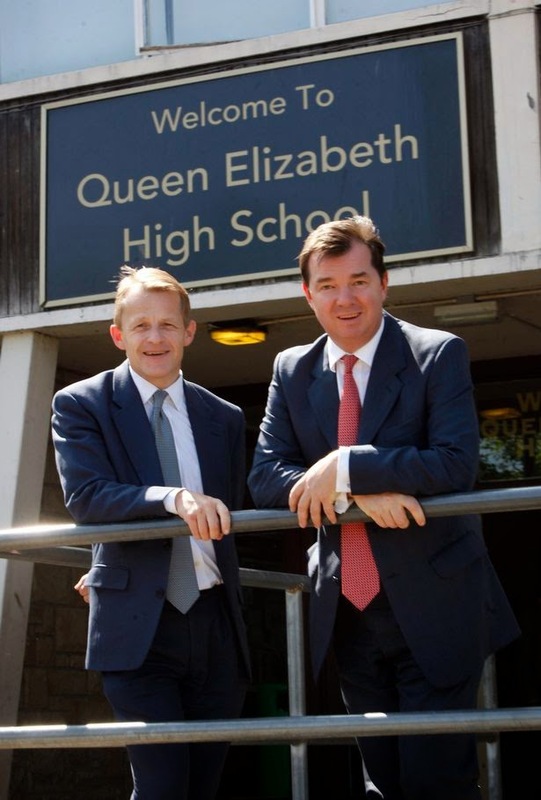 The Schools Minister David Laws saw first hand the issues facing QEHS after visiting the school at my request in July 2013. He accepted an invitation and saw for himself the condition of the school buildings as part of the our lobbying efforts. With this new investment that is exactly what will happen. The success of Prudhoe and QEHS's bid follow decades of complaints within Tynedale that rural areas had been neglected by Westminster when it came to funding for repairs. Last month I raised the funding bid in the House of Commons urging schools minister David Laws to include Queen Elizabeth High School in the government's Priority School Building Programme (PSBP), which addresses the needs of sites most in need of urgent repair. get even better. After all of our efforts this really is wonderful for the future education of kids in our town. The welcome news for QEHS came as part of £140m Government investment to rebuild 16 more schools in the North East. I support William Hague's plans to revise the voting rules to ensure Scottish MPs do not hold the rest of the country to account. It is fundamentally wrong that Scottish MPs should decide how things such as schools and the health service are run in England, when English MPs have no such say over how they are run in Scotland. I cannot see how this can continue to be justified as devolution continues to expand the Scottish governments powers. Before a Bill or parts of a Bill affecting only England, or England and Wales, is put to its final Commons vote, English and in some cases Welsh MPs would meet separately to consider it. In addition, only MPs for English constituencies (and Welsh seats where relevant) would be allowed to take part in the committee stage, where the fine details are thrashed out and amendments proposed. But MPs from all parts of the UK would be entitled to take part in the final Commons vote passing the Bill into law. Options are running out for Greece, but do we want Greece in league with Russia? The saying is - "beware Greeks bearing gifts". In this case the EU is asking - do we give the Greeks any more gifts? Looking at the Greek financial problems and the consequences of the EU being too kind to its spendthrift neighbour I fear that brinkmanship by the Greeks will scupper any deal. “A deal may still be possible but the Greek side will have to move most,” said Guntram Wolff, head of the Bruegel thinktank in Brussels. As the Guardian reports: It is not only northern German-led fiscal hawks who are resisting the demands of Tsipras. Spain and Portugal, who have also been bailed out and having gone through their own wrenching austerity programmes, show no sign of being generous to the Greeks. France and Italy, meanwhile, though broadly sympathetic to an easing of fiscal rigour, have been irritated by Tsipras’ megaphone diplomacy, seen in Brussels and elsewhere as importunate, hubristic and counter-productive. For my part I would not be giving the Greeks any money unless they left the straight jacket of the Euro. It is obvious they are incapable of living within their means. So let them quit the euro and devalue their own currency. But, of course, the Greeks do not want that. Even the far left new Greek government still wants the rest of Europe to pay its bills. Sir Peter Tapsell (Louth and Horncastle) (Con): May I put it to the Prime Minister that from President Monroe onwards it has been generally acknowledged by leaders of great powers that, for the avoidance of war, it is often wise to acknowledge the concept of traditional spheres of authority and power; and that although Ukraine is of absolutely no significant strategic importance to Britain, Greece most certainly is; and that unless western statesmen show rather greater skills than they have in recent years, Greece will pass into the Russian sphere of influence without a shot being fired? The Prime Minister: It is difficult to answer the Father of the House without a long, historical exegesis, but I would argue that, when it comes to Ukraine, it does matter on our continent of Europe that we do not reward aggression and brutality with appeasement; that would be wrong. That is why it is right to have the sanctions in place, right to keep the European Union and America together on the issue, and right to stand up to President Putin. On Greece, of course there is a British interest, which is that we want stability and growth on the continent of Europe. The eurozone crisis has held that growth and stability back; we want those concerned to come to a reasonable agreement so that Europe can move forward. It is good that the British economy is growing and jobs are being generated, but we have to recognise that our largest market at the moment is still relatively stagnant, and the situation in Greece does not help that. On the day 40 years on from when in 1975 this country celebrated appointing it's first female Prime Minister, the Labour Party has been responding to criticism of the Pink Bus; the bus, pictured, today arrived & then parked on a Zebra Crossing in Stevenage. You could make the point that the bus is not British but was built in Turkey, is to be driven in the future by a male driver loaned by the union Unite, and this after a campaign last year against gender specific toys. Like I said you could not make it up. 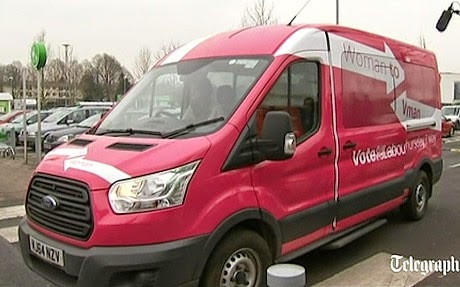 This comment featured in the Guardian in defence of the Labour Pink Bus: “a bright pink minibus of female Labour MPs will tour constituencies to talk to female voters around the kitchen table”. Mark Ferguson, editor of the LabourList website, also expressed concerns, tweeting that he had thought it was a wind-up when someone first told him about it two weeks ago. He claimed it was an “unnecessary own goal”. "The past month has seen an escalation of violence in the eastern regions of Ukraine. Fighting has been intense around the town of Debaltseve, a strategically important rail and road hub between the cities of Donetsk and Luhansk. The Ukrainians have suffered indiscriminate missile attacks on buses in Donetsk and Volnovakha and on the port city of Mariupol. What is happening on the ground now resembles, to all intents and purposes, a small-scale conventional war. Over 5,000 people have been killed since the crisis began last spring, and over 1.5 million people have been displaced from their homes. In recent weeks, Russia has aggravated the effects of its initial incursion by stepping up the military support it provides to its proxies. It has transferred hundreds of heavy weapons, including rocket launchers, heavy artillery, tanks and armoured vehicles; and it maintains hundreds of regular soldiers, including special forces, in Ukraine, as well as command and control elements, air defence systems, unmanned aerial vehicles, and electronic warfare systems. The Russian army is also the source of ex-regulars who resign their army posts to fight in Donbass as “volunteers”. The recent escalation in fighting would not have been possible without the military support and strategic direction that Russia provides. In these circumstances, it is vital that all the countries who have a stake in the rules-based international system remain clear and united against Russian aggression. In Normandy last summer, we agreed with the US and our European partners that the most effective channel of communication with the Kremlin would be through a small group. This is known as the Normandy Format, comprising Germany, France as the host of the Normandy meeting, Ukraine and Russia. Chancellor Merkel and President Hollande met President Poroshenko in Kiev last Thursday, and President Putin in the Kremlin on Friday. On Saturday, in Munich, I held meetings with Secretary of State Kerry and German Foreign Minister Steinmeier to assess the prospects for a diplomatic resolution of the crisis. On Sunday, the German Chancellor and the French President held a conference call with Poroshenko and Putin, agreeing to meet in the Normandy format in Minsk tomorrow. Their aim is to reach agreement on an implementation plan for the Minsk ceasefire agreements that the Russians entered into last September, updated, as they need to be, to reflect subsequent changes on the ground. The UK welcomes these efforts to achieve a peaceful resolution of the situation in eastern Ukraine, while remaining sceptical of Russian commitment to such a resolution. It is clear that Putin respects strength, so Britain’s focus has been, and will continue to be, on ensuring that the EU remains robust, resolved and united on the maintenance of economic sanctions, and closely aligned with the US. recognise Russia’s illegal annexation of Crimea. The emergency EU Foreign Affairs Council on 29 January agreed to roll over all the Crimea-related tier 2 sanctions against individuals and companies. That is another clear sign that the EU remains united in its response to Russian action in Ukraine. The package of economic sanctions which the European Union and the US has imposed on Russia, coupled with the catastrophic impact on the Russian economy of the decline in the oil price, is a critical element of the pressure on President Putin to change his behaviour. Britain was and remains at the forefront of the successful effort to build and maintain an EU-wide consensus on a sanctions regime on Russia, to the evident surprise and dismay of the Kremlin. Yesterday in Brussels I represented the UK at the EU Foreign Affairs Council, which discussed Ukraine and reconfirmed its decision to apply additional sanctions, but, at the suggestion of the Ukrainian Foreign Minister and as a gesture of support for the political process, decided to delay their entry into force until next Monday. The informal European Council of Heads of State and Government will have further discussions about Ukraine on Thursday. The crisis has inflicted substantial damage on Ukraine’s economy. The World Bank estimates that it shrank by 8.2% in 2014. Public debt has risen sharply, foreign exchange reserves have fallen and the currency has lost nearly half its value against the US dollar. Ukraine clearly needs support from international partners to stabilise the economy, in return for which it must pursue the reforms to which it has committed under the association agreement with the European Union and the International Monetary Fund programme. Britain is providing £10 million in technical assistance to support economic and governance reforms and the humanitarian effort. The EU will make a substantial contribution to the immediate estimated $15 billion financing needs of the country, the majority of which will be provided through an IMF-led package. We shall also continue to work through NATO to offer technical support to the Ukrainian armed forces and reassurance to our eastern NATO allies. At the NATO Wales summit last September, NATO allies sent a strong message to Russia, agreeing to maintain NATO’s long-standing capacity building work in Ukraine by setting up five dedicated trust funds for Ukraine, one of which will be co-led by the UK. The Wales summit also agreed a readiness action plan to reassure our eastern allies. As part of the package, NATO allies agreed to a new spearhead unit—the very high readiness joint taskforce—within the NATO response force, which, supported by the newly created forward integration units in the Baltic and eastern European states, will be able to deploy at very short notice wherever they are needed. On 5 February, NATO Defence Ministers agreed the size and scope of that mission. My right hon. Friend the Defence Secretary has announced that the UK will lead the force in 2017 and on a rotational basis thereafter. The UK also made a commitment to contribute to headquarters in Poland and Romania and the six NATO forward integration unit headquarters in the Baltic states, Poland, Romania and Bulgaria. In addition, the UK will contribute four RAF Typhoons to operate alongside Norway in support of the Baltic air policing mission. The UK also remains a strong supporter of the OSCE’s monitoring mission in eastern Ukraine. We have provided funding of more than £2 million, the second largest number of monitors and 10 armoured vehicles to allow monitors to move around dangerous areas in a more secure manner. Our policy since the start of the crisis has been to supply non-lethal assistance to Ukrainian armed forces, in line with our assessment that there must be a political solution to this crisis. We have increased our defence engagement with Ukraine and are providing additional support on crisis management, anti-corruption, defence reform and strategic communications. We have offered three members of the Ukrainian armed forces who were wounded in the Donbass life-changing specialist medical assistance in the form of reconstructive surgery at the Queen Elizabeth hospital in Birmingham. We are providing a substantial package of non-lethal equipment to Ukraine, comprising medical kits, winter clothing and equipment, body armour, helmets and fuel. The package is focused on reducing fatalities and casualties among members of the Ukrainian armed forces. It is a national decision for each country in the NATO alliance to decide whether to supply lethal aid to Ukraine. The UK is not planning to do so, but we reserve the right to keep this position under review. Different members of the alliance take nuanced positions on this question, and are entitled to do so. However, we share a clear understanding that while there is no military solution to this conflict, we could not allow the Ukrainian armed forces to collapse. By its illegal annexation of Crimea and its destabilising activities in eastern Ukraine, including its direct military support of the separatists, Russia has demonstrated its disregard for international law. It is clear that President Putin respects only strength, and by standing united, using our combined economic muscle to impose significant economic costs on Russia, the international community has shown its determination to rebuff Russia’s anachronistic behaviour. The ball is now firmly in Russia’s court. Until we see Russia complying with the terms of the Minsk agreement on the ground—withdrawing troops, stopping the flow of weapons and closing the border—there must be no let-up in the pressure. Fine words in a declaration tomorrow will, of course, be welcome, but we have seen them before. The proof of the pudding will be in actions on the ground. We will monitor the situation carefully, and we will agree to a relaxation of the pressure only when we see clear evidence of changed Russian behaviour and systematic compliance with Russia’s obligations under the original Minsk agreement. Meanwhile, there will be no let-up in our efforts—with the US, in the EU and through NATO—to ensure that Mr Putin hears a clear and consistent message: civilised nations do not behave in the way Russia under Putin has behaved towards Ukraine, and those of us who live by the rules-based international system will be steadfast in defending it against such aggression. I commend this statement to the House"
The NCC add that "We expect Riding Mill and Barrasford to be live by the end of this month". Clearly there are significant on-going problems with some places not listed above and I am trying to get bespoke solutions to problem areas like Matfen. Where you disagree with this information NCC and BT are giving me please let me know. "Inside the Commons" BBC 2 tonight - and yes it was me seen sprinting around the Commons twice last week! I have filmed a short couple of interviews for later in the series, both on the need for reform of the House of Commons and a short commentary [from both sides] on my long running scrap with Ed Balls. Will be watching to see what this weeks revelations bring. i). One of Labour party’s biggest business backers when Tony Blair was leader has said he is now “frightened” by the idea of the party winning the general election. Sir Charles Dunstone, the co-founder of Carphone Warehouse, said business people “feel very detached” from the party and “isolated” by its lurch to the Left under Ed Miliband. Under Tony Blair he was one of the business people who signed a letter supporting Labour. But he told the Financial Times: “As a business person I’m frightened of an environment where there isn’t sufficient emphasis put on growing the economy to grow tax receipts to spend more." The comments come after Labour has faced repeated criticism from business leaders and former donors for failing to support businesses. iii). Lord Noon, a Labour peer who has given hundreds of thousands of pounds to the party, made his intervention after Ed Balls’ inability this week to recall a business donor’s name onthe BBC’s Newsnight, and Ed Miliband’s failure to raise the deficit in his conference speech last autumn. In an interview with the Guardian, Noon said: “I cringed when Balls forgot the name of a business backer and Ed forgot whole paragraphs from his conference speech. It is very embarrassing”. Gulam Noon, who has given nearly £873,000 to the party, £100,000 of that since Miliband became leader, made his fortune from the manufacture of ready meals and is worth an estimated £75m. SME's & Businesses create the jobs we all need - that must be the message from todays Chamber of Commerce conference - which Ed Miliband did not attend. I have constituency meetings in Stamfordham and Hexham today, a brief chat with Tynedale Hospice and then will be at the Beaumont Hotel for the Young Employee of the Year awards. Looking forward to it. I am then sprinting for the train to London as we have debates and votes this evening. Today is a working Sunday with a business visit first thing in Otterburn, two home visit surgeries in Hexham and the Hexhamshire, then a long planned meeting of the team behind the Tynedale Community Bank at 5. Interviewed by Richard Moss along with Pat Glass, Labour MP. We will be discussing transport plans, education and academies. Throughout the 2010-2015 period 4-16 education funding has been protected, along with the NHS and international development budgets. There has also been extra money for free child care for under 3s up to 15 hours a week. I have over 45 schools to look after, including 4 High Schools, 8 Middle schools, one academy and over 30 first schools or primaries. I have visited pretty much every one recently, and particularly pay attention to the High Schools. In the last month I have held multiple meetings with Hexham QEHS, Prudhoe and Haydon Bridge teachers and head teachers. i). Fairer Funding - traditionally for 30+ years successive governments have underfunded Northumberland when compared to urban councils. For example, Northumberland receives over a £1000 less per pupil than many of the councils in Urban Tyne and Wear. We have addressed this with the Fairer Funding £12 million which arrives this spring. ii). School rebuilding programmes: we have successfully obtained funding for the total rebuild of Prudhoe Community High School. This rebuild commences this spring and I met with the Headteacher on Friday. We have also campaigned very strongly for rebuilding and improvements to Hexham Queen Elizabeth High School. Going forward the Conservative manifesto is for a cash terms freeze on education funding for 4-16 education. This is the best offer by any political party on deviation funding. As we discussed in the Sunday Politics discussion the Labour Party have not set out any plans on education funding. The pupils at Haydon Bridge deserve the best possible education. I visited the school just last month and met some of the pupils and teachers. It is important now that the County Council takes the right action, in consultation with parents, to get to the school back on track. I was at Haydon Bridge High School just 3 weeks ago to meet with the acting Headteacher, Helen McCormick, and several of the teachers. I was informed of the contents of the Ofsted report in outline on Monday, albeit I was in Westminster. I was not informed of the meeting the school called for parents that day, until later that day itself, although one of my local county councillors was able to attend keep me updated on the discussion that took place. I have met with many of the governors of Haydon Bridge High School and, of course, my other 45+ schools down the years, albeit I do not know and have not met the present chair of the governors at Haydon Bridge. The view of the Ofsted report, and the view of the Northumberland County Council, is that the actions of the governors has been unsatisfactory for some time, and that they have not addressed the problems of the school. I regret to say that it does appear that the governors have not previously taken the advice of Northumberland County Council, who are ultimately responsible for the school as the Local Education Authority. In term of going forward my office and I will be keeping a very close eye on the situation and will help in anyway we can. Discussion have already taken place with the Northumberland County Council's corporate Director of Children's Services, and a meeting will take place in a few weeks to assess the situation. In the immediate term the County Council has applied to the Secretary of State for Education for permission to dismiss the current governors and replace them with what is called an IEB - an Interim Executive Board. I, and others, have seen this IEB part of the process before with Prudhoe Community High School in 2013-2014; the IEB was able to turn around Prudhoe without further action. I went to Prudhoe High School on Friday for a long scheduled meeting and met once again with Deborah Reeman the outstanding new Headteacher. Prudhoe is a good example of an IEB coming in and providing the guidance, support and expertise that is needed where school governors get into difficulties. An IEB effectively provides the outside specialist help that a "special measures" school needs. I have already been in touch with the Secretary of State for Education, Nicky Morgan MP, to request the application for an IEB is now considered as a matter of urgency, given the Ofsted Inspection in December, and the actual report, published this last week. I will be working with the NCC and the DfE to ensure that this is done as quickly as possible. Since 2010, the Coalition Government has undertaken the most radical programme of decentralisation within England in a generation. There are now five combined authorities, including our LA7 in the North East, 15 directly elected local authority mayors and plans for a Metro Mayor to be elected for Greater Manchester in 2017 - as enthusiastically endorsed by a Labour led Greater Manchester Council. The Localism Act has moved significant powers away from Westminster to local areas and neighbourhoods. It introduced local referendums on Council tax levels, the right for local communities to list local assets of value to the community and to take over local services where local people believed they could be run better. It also devolved planning functions from councils to local communities through the introduction of Neighbourhood Plans, approved by the local community in a referendum. Almost 1,400 communities are now engaged at different stages of the neighbourhood planning process, giving millions of people the chance to participate in identifying, and voting on, where development takes place and what it looks like. All 49 referendums held to date have resulted in substantial yes votes and these plans have significant weight in planning decisions. We expect the first 40 plans to reach examination to provide in the region of 10,000 new homes, as well as shaping their character and location. This is local people going to meetings and taking part in decisions about their street or village which are then put into action. Rolled out further this will represent a quiet revolution in how planning decisions are made. Local Growth deals are revolutionising the way our economy is run. For the first time ever, infrastructure, housing, and other funding has been brought together, and put directly into the hands of local authorities and businesses to invest with their knowledge of what is needed in their area to maximise their potential economic growth. These deals are helping ensure young people receive training, creating thousands of new jobs, building thousands of new homes and involving hundreds of infrastructure projects; including transport improvements and superfast broadband networks. After attacking Nuns, the Chuckle Bros, Boots, & business what next for Labour? Remarkable week for Balls and Miliband: the attack on business leaders, job creators, aged comedians in the form of the Chuckle Brothers...and even Nuns, thanks to Labour Tristram Hunt MP's bizarre behaviour during Question Time, was only capped by Ed Balls inability to name one single business was leader save for somebody called "Bill".